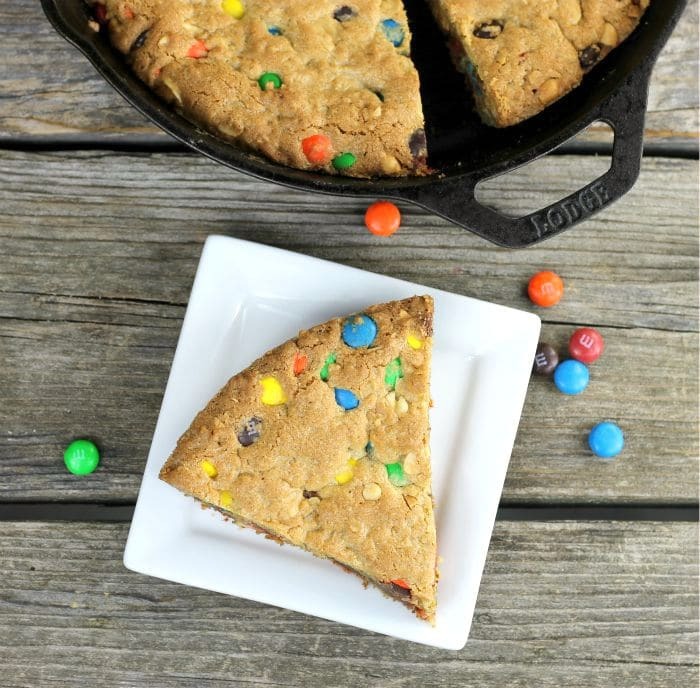 This oatmeal M&M skillet cookie is one of my new favorite skillet recipes. I love cutting a slice of the cookie when they are still warm and eating them with a scoop of vanilla ice cream. Probably the next best thing to heaven. I have been having fun making all kinds of recipes in my cast iron skillet. I purchased it in the last year and never did I dream that I would be making so many different recipes in it. I have made anything from bread to Mexican rice. And you know what? I can’t wait to see what will be coming in the future. 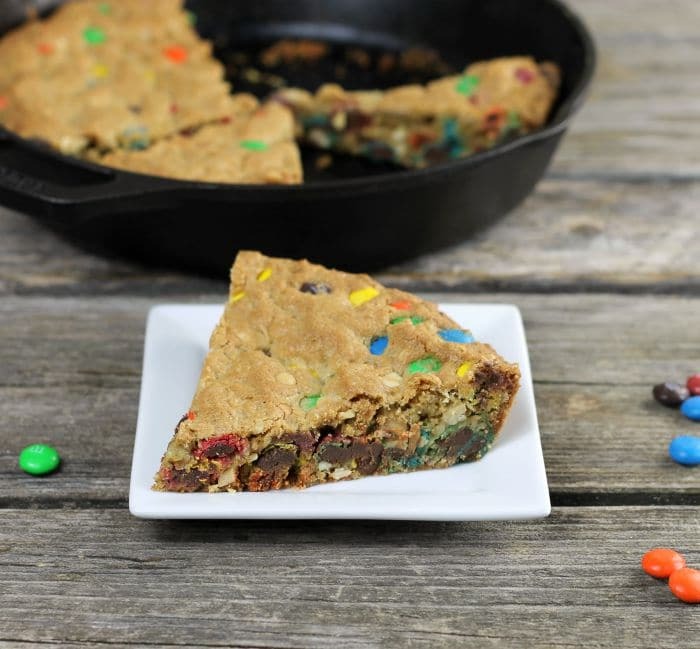 The last time I made this oatmeal M&M skillet cookie some of the kids were at home. They all gave it a big thumbs up. I am not sure who would not love to have a piece of this cookie. Really, it is chock-full of M&M, oatmeal, and peanuts. Do you have to make these in a cast iron skillet? To tell the truth, I have always made these in a cast iron skillet, but I am sure if you have an oven-proof skillet you could use that. But keep in mind that the cooking time will probably vary. 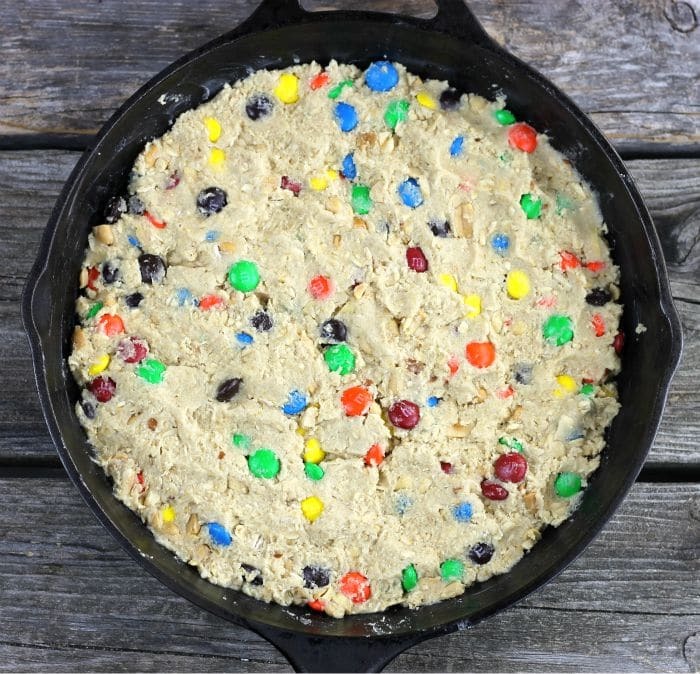 Do you have to use M&M in this recipe? No, if you don’t like M&M or you would like to change them out you can use chocolate chips or whatever flavor of baking chips you like. In a medium bowl cream together the butter, brown sugar, and sugar with an electric mixer. Add the egg and then the vanilla and mix in after each addition. Sift together the flour, oatmeal, baking soda, and salt add to the wet ingredients and mix until well combined. 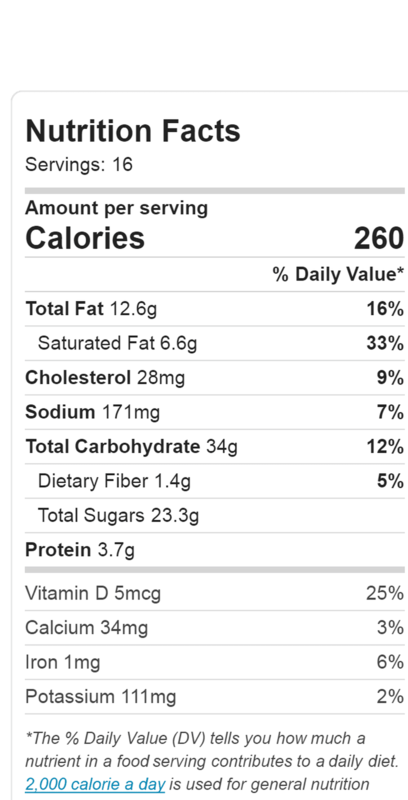 Add the peanuts and M&Ms and mix in with a wooden spoon or by hand. Pat the cookie dough into the prepared skillet. Place in the preheated oven and bake 25 to 30 minutes or until the cookie is nicely browned. It can be served right out of the oven (but be careful not to burn your mouth) or cooled and cut into wedges. If serving warm they are delicious with a scoop of vanilla ice cream. Such a fun and delicious cookie treat! Hey Dawn! I’m big into using and owning local cast iron. But any cast iron is fun. Just something that we really love. And bakes work so great. Eating those warm sounds sooooo good! And I don’t even have a sweet tooth, but those look fantastic. Happy Weekend! 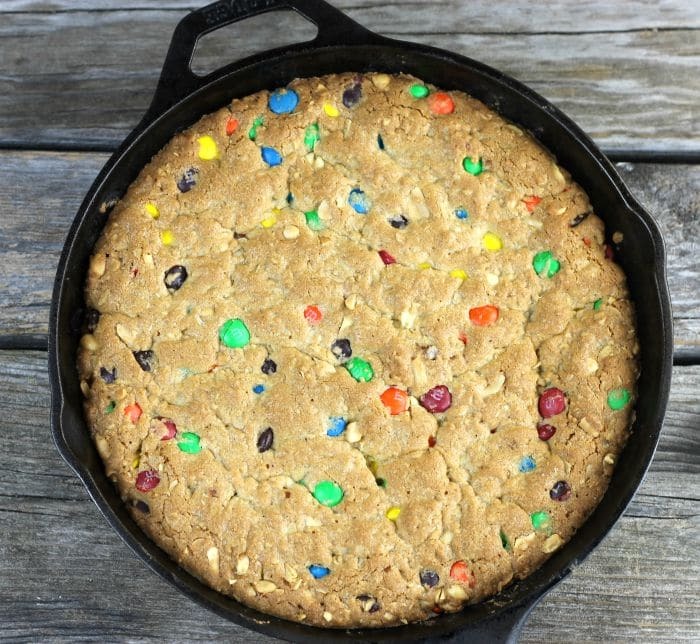 This is such a “happy” cookie…I love the M&Ms in it…so charming in the iron skillet…thanks for the recipe Dawn. 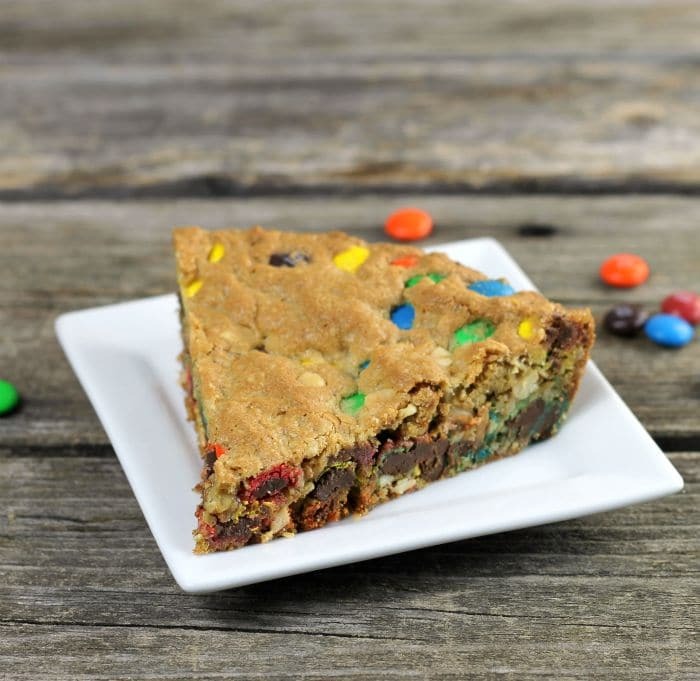 I love m&m’s in cookies so I’m crazy about this one – how delicious with a scoop of ice cream! I haven’t used my cast iron skillet in such a long time! I need to break it out. I’ve always been a sucker for a good oatmeal cookie, and I love pulling out the cast iron skillet, too! This cookie wouldn’t last long in our house I’m afraid. Looks delicious, Dawn!